Our GARDENS have always been regarded as an enclosure in which to create a retreat that is usually far removed from what is going on in nature. Is it necessary for the gardener to be at odds with nature? We need to rediscover the natural elegance of our native plants. enature.com Best site to search your AREA for information on plants, animals, insects, butterflies, invasive species etc. Lady Bird Johnson Wildflower Center click "Explore Plants"
LITTLE BLUESTEM - (beard grass) is native to prairies and open woods, dry fields and hills in all states except California, Washington, Oregon and Nevada. Originally one of the most characteristic grasses of the American tallgrass prairie, wide ranging and tolerant of moisture conditions. LITTLE BLUESTEM can reach 8 foot in height and is 'little' only in comparison to its prairie relative 'big bluestem'. Foliage color is quite variable. Some populations are bright green others are light blue, often with conspicuous purple tints. Fall and winter color varies from tan to copper-orange to dark orange-red. The blue-leaved selections are showy enough to merit consideration even in highly designed landscapes. Plants are the foundation of wildlife habitat in any ecosystem--including your backyard or garden! In any given region, plants and wildlife evolved together over millions of years and are called native species to that region. Native plant communities provide habitat for wildlife in all seasons. Since native plants are adapted to the local soil types and climate they don't require wasteful watering or polluting fertilizers and pesticides once established. For these reasons, the best way to provide habitat for wildlife in your yard or garden is by planting species native to your region. Many plants available for sale at your local garden center are native to other parts of the world. When planted in regions where they are not native, such plants are called exotic species ( they are also sometimes called non-native, introduced and alien species). Some exotics spread prolifically, escaping the garden and invading the surrounding natural areas. Such invasive exotic species out-compete and eliminate native plants upon which wildlife depend and are a serious global ecological problem. INDIANGRASS is one of the most beautiful and charcteristic grasses of the once-vast North American tallgrass prairie. In the original prairie mix, this clump-former was the second-most prevalent tall grass next to big bluestem. INDIANGRASS is a native, perennial, warm-season tall grass which reproduces from seed and short, scaly, underground stems. The beautiful golden plume-like seed heads are on stems from 4 to 8 feet tall. 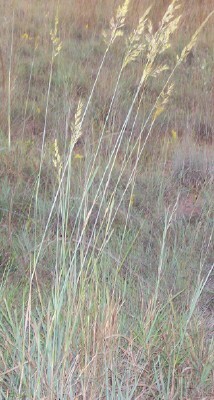 Indiangrass is found growing throughout the bluestem belt of the United States and is one of the most important tall grasses. Yellow flower heads rising from upper half of stalk on rough stems. Leaves: 4-6" long, stiff, narrow, tapering at both ends, rough on both sides. 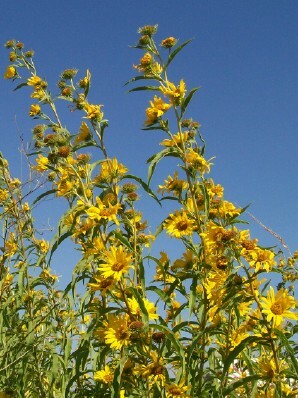 A native prairie perennial, this sunflower is a desirable range plant, eaten by many livestock. A heavy crop of seeds is produced, thus it is also a valuable plant for wildlife. It was named for the naturalist Prince Maximillan of Wied-Neuwied, Germany, who led an expedition into the American West in the 1830's. 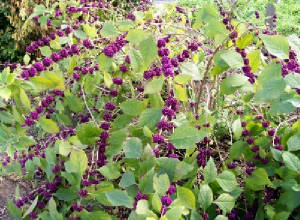 American Beautyberry is a harry shrub with numerous arching branches reaching 6 feet in height. The fruit is berry like, magenta in clusters. The seeds and berries are important foods for many species of birds, particularly Northern Bobwhite. The foliage is a favorite of White Tailed deer. 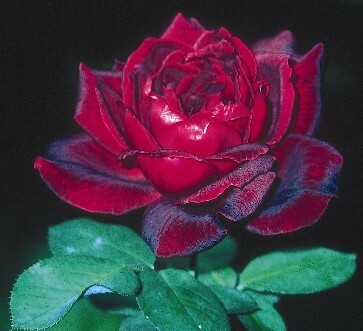 It is native in Maryland, Tenn, south to Florida and west to Mo, Oklahoma and Texas.